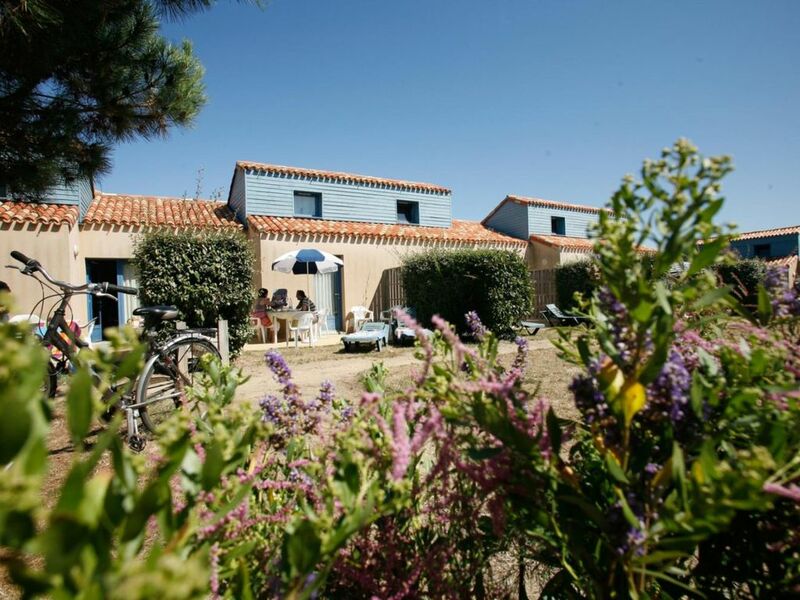 The holiday park Le Domaine Résidentiel de Plein Air Saint Martin invites you to a wonderful holiday in Talmont Saint Hilaire, where you can enjoy the sunny Vendée, the fantastic beaches, salt marshes and islands. At 9km south of Les Sables d'Olonne and at 300m from the sea, this holiday park is located on the rugged coast. Veillon Beach is 3.5 km away and several shops can be found in Port Bourgenay, 2 km away. Facilities of the park include an indoor and outdoor swimming pool. The indoor pool with jacuzzi is open from April to October, and the outdoor swimming pool is open from mid-May to mid-October. Other facilities include a tennis court, volleyball, basketball, table tennis, a playground and paid internet at reception and bicycle rental. This small home has an area of about 45 m2 and can accommodate 4 to 6 persons. It consists of 2 bedrooms, a living room, kitchen, bathroom with shower and separate toilet. The living room is furnished with a sofa bed for 2 persons. One of the bedrooms has a double bed while the other contains 2 twin beds. The kitchen is equipped with a fridge, freezer, hotplates, microwave and dishwasher. The accommodation also features a garden of about 30 m2 and a terrace with garden table and chairs. Extra services are available as well. Payment of these ones is to be made locally. Guests can make use of an unheated outdoor pool with a children's pool open from mid-May to mid-September, a heated indoor pool with spa open from April to the end of October. Volleyball court, table tennis for tennis and basketball. Children's playground, internet connection for a fee at the reception, bike rental. A free shuttle bus in July and August for the beach at Le Veillong or the beach Les Sables d'Olonne. For an additional fee, you can reserve a TV, end-of-stay cleaning and a baby kit. Bed linen and towels are not provided. Fun activities for children are organized in the summer, in July and August. The representative of Odalys will be present to inform you during your stay about the possibilities of your holiday region, such as free activities for five half days a week for the children of 4-11 years old, free Adoshpere teen club of 12-15 years old , a day program for everyone with entertainment and activities. A deposit and tourist tax must be paid on arrival. The deposit will be returned to you on the day of departure after the inventory or by mail. The accommodation must be spotlessly clean, otherwise you will only receive a part of the deposit back. Pets are allowed at a surcharge, only 1 pet per accommodation, provided they have a valid vaccination certificate and a tattoo, if they are held at the head of the property. With the large number of sun hours of more than 2600 per year and 240 km of sandy beaches, this is the ideal destination for a wonderful holiday. There is the blue Vendée with the islands of Yeu and Noirmoutier and many opportunities for water sports, harbors for fishing boats and salt marshes. Then there is the green Vend��e with the deciduous and coniferous forests, Marais Poitevin (the green Venice) and the richness of the interior. Enjoy horseback riding, water sports at the park's beaches or rent bikes to follow the trails through the forest. For golf lovers, there is the 18-hole golf course of St. Jean de Monts. Other possibilities are the shell museum (9 km), Chateau Pierre Levée, the automobile museum (7 km), Chateau de la Guignadière and its 86 hectare park (in Avrillé, 10 km) and the castle of Gilles de Rais in Tiffauge (80 km).